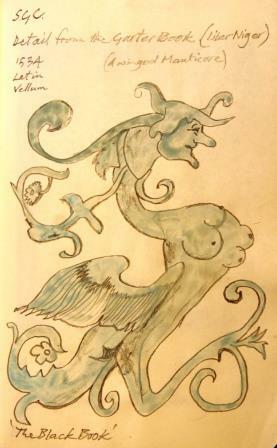 Strange creatures represented in medieval manuscripts are not uncommon. They can be seen mostly in the margins of many early European illuminated manuscripts and early books dedicated to animals are generally known as bestiaries. 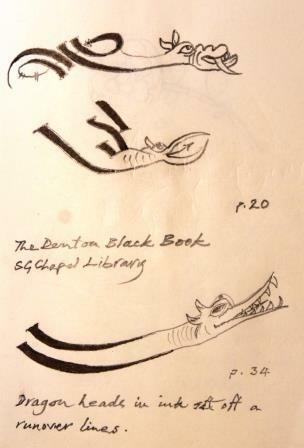 Some of our own manuscripts at St George’s Chapel Library and Archives, although not bestiaries, contain images of strange creatures and as well as in manuscripts they can be seen, with a little difficulty, under the stall seats in the quire of the Chapel where the wonderful medieval oak-carved misericords feature many animals, both real and imagined. 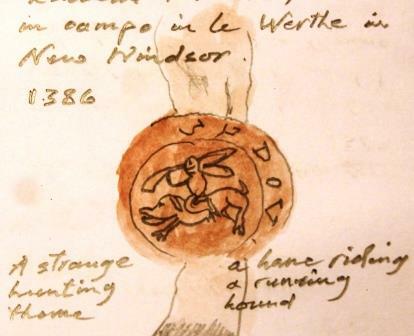 What readers may find more unusual is that strange animals appear again on old wax seals, and these are well represented in the fascinating collection of medieval wax seals attached to legal documents in the archives at St George’s Chapel, see images below. 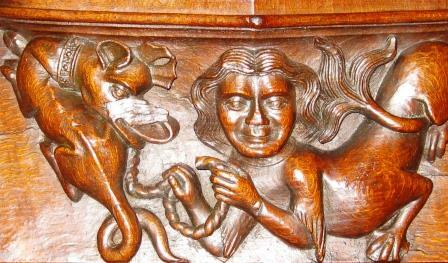 The background to beasts as art in books, paintings, carvings, sculpture, and seals etc., is as interesting as many of the other incidental details of medieval artwork and gives rise to a specialised subject fairly well documented by scholars of history and nature. So many strange creatures are the result of stories and legends told by peoples hundreds of years ago all over the world and to this day never seem to lose their fascination and fear factor, especially to the young. Bestiaries in medieval times were second only to the Bible in their popularity and wide distribution. They were catalogues of animal stories combining known zoological information as well as myths and legends of bizarre, exotic and monstrous creatures drawn from verbatim tales of scary imagined animals by creative storytellers. Homer was a very good proponent of them several hundred years BC, viz. CERBERUS the three-headed dog with sharp teeth who guarded the entrance to Hades, the underworld. Perhaps the most famous, or infamous, creature known today is the DRAGON, of which we know something here at St George’s. Our depicted dragon is almost certainly slain by our English patron Saint George and the two of them can be seen in various places around the Chapel and environs, including a fine gilt statue situated in the courtyard of the Dean’s Cloister. 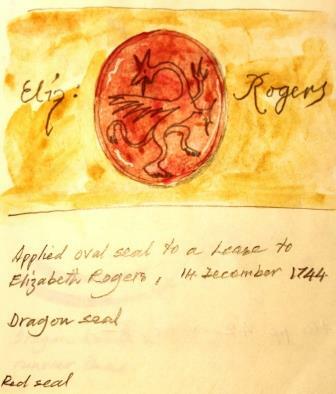 The Library and Archives have many representations of St George and the Dragon and perhaps the best images are on the Chapter seals attached by parchment tags to legal documents. 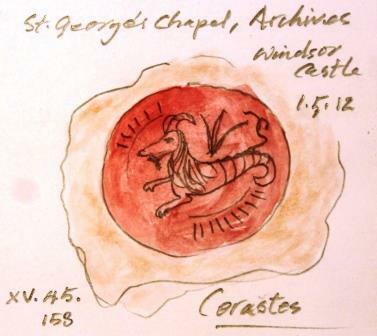 Another strange creature to be discovered on a fine small seal is the CERASTES, a serpent with horns and a snake-like tail and a flexible spine-less body. According to legend it would cover itself with sand, apart from the horns, with which it would allure its prey, and then suddenly spring up, catch the victim and devour it. MANTICORES appear frequently in medieval art; these are hybrids of various animals, including men and women, having the head of one creature and the body of another. Perhaps the most well-known kind of manticores are MERMAIDS. They would be beautiful women from the waist up, but instead of having legs and feet their bottom half would be a fish’s tail, and in some ancient stories they could be found helping people at sea in distress, but more often than not their siren calls would lure seamen to a watery grave. The heraldic beast of King Edward III (the creator of the chivalric Order of the Garter in 1348) is the UNICORN, a mythical creature resembling a small horse with one spiralled horn growing out of its forehead. According to medieval writing the horn represented the Gospel of Truth. The Unicorn was an untameable beast that could only be captured by a young virgin. It supports the British Royal coat of arms, along with its traditional enemy, the lion. There are more strange creatures to be seen, if one cares to look, at St George’s Chapel, or by appointment at the Chapel Library and Archives. You could also take a look at an interesting article by Dr Alixe Bovey, Head of Research at The Courtauld, on the British Library’s website, which includes videos of strange creatures. For further reading on this topic, Julia Cresswell’s book Legendary Beasts of Britain (Shire Library, 2013) can be purchased from the St George’s Chapel shop. My grandson Oliver assures me that scary new creatures continue to terrify in the forms of the Basilisk and Aragog (Harry Potter), Azog (The Hobbit) and Godzilla (Godzilla) etc., so the myths and legends are out there… be very, very afraid!